Bright and breezy, Au Soleil holds true to her name. A great boat for families or couples who want a cozy modern home away on the water with plenty lounging space and relaxed vibes. In addition to the three guest cabins, two single forepeak berths are available for children. Save 5% off new reservations sailing available dates May through end of July 2019 in the Virgin Islands. Available 20 May 2019 through 31 Jul 2019. Contact us for rates and current availability or to book a charter aboard Au Soleil! 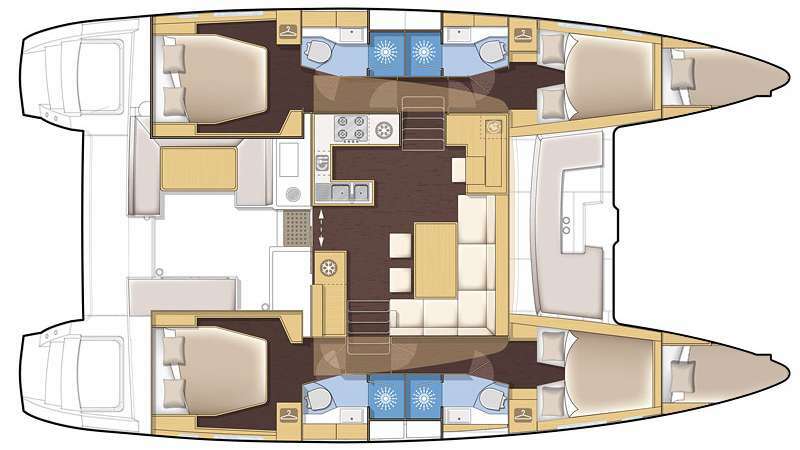 There are three staterooms with en-suite bathrooms, 6'6" headroom, and individually controlled air conditioning. Other Kids life jackets available.